Monaco is one of those cities you really have to visit once every while, just to breathe the atmosphere of luxury lifestyle and jet-setters. Fans of independent watchmaking now have a new (or other) excuse to pay Monaco a visit… The launch of independent watch manufacturer Les Ateliers deMonaco! The Ateliers DeMonaco Carre d’Or is a watch that should remind us of the famous and most exclusive squares in the world, located in Monaco between the famous Royal Casino and a number of five star hotels. 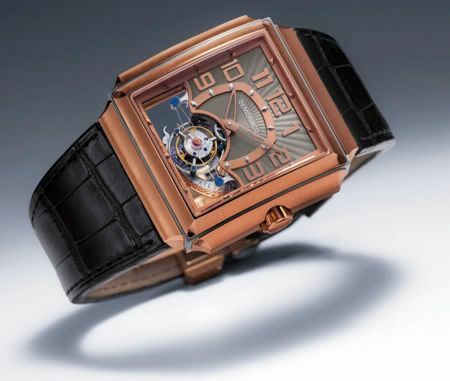 The Carre d’Or has a convex case design, a patentend Grand Tourbillon movement that uses a sapphire bridge that makes it look like the one minute tourbillon is floating inside the watch. This watch measures a whopping 44.3mm x 48mm x 15.3mm which demonstrates that the big watches are here to stay! The watch is available in both yellow and white gold. Les Ateliers DeMonaco have a magnificent website, including their own blog. It covers the recent presentation of the watch (with Prince Albert II of Monaco) and the prototyping of the watch movement. An interesting read for all you die hard watchmaking fans! Click here to visit the Les Ateliers DeMonaco blog! Hoping to see their watches in the flesh soon, I at least will keep an eye on their blog to keep track of their activities in the world of independent watchmaking and haute horlogerie..